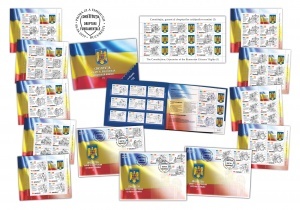 Having as its objective a premiere theme related to the Romanian Constitution, the fundamental rights and freedoms section, Romfilatelia introduces into circulation, on Monday, April 8th, current year, the postage stamps issue “The Constitution of Romania, Guarantor of the Romanian Citizens’ Rights”. It is an issue that is part of the Centenary of Romania celebration and the national and international historical events that made it possible for all Romanians to be effectively united. Since 1918, the Unification offers everyone the opportunity to enjoy the same rights and freedoms, regardless of ethnicity, religion or ideological choices, in a common space called Romania. In order to present in a suggestive graphic concept the fundamental rights and freedoms, 9 articles from the Constitution, essential for a democratic Romania – a nation that has gone through a difficult road until its reunification and then from communism to a free society – were selected. These rights have remained inalienable from the very moment of the adoption of the fundamental act of post-revolutionary Romania as a legal expression of the citizens’ convention, which expressly mandates the State institutions to guarantee them and ensure the exercise of their rights. The tricolour flag, the national day, and the coat of arms define the Romanian State in the international relations, through elements cast in stone throughout the history representing the Romanian nation. The Centenary and the events dedicated to it are about the past, the present and the future. The future of the country is closely linked to the priorities assumed by the whole people, and it is time to admit that, when we talk about the right to education, health, a healthy environment, European cohesion, these are common values that unite us. Article 12 of the Romanian Constitution is represented by a stamp with a face value of Lei 1.70 and has been selected to illustrate the national symbols that represent us as Romanians: the flag, the national day and the anthem. 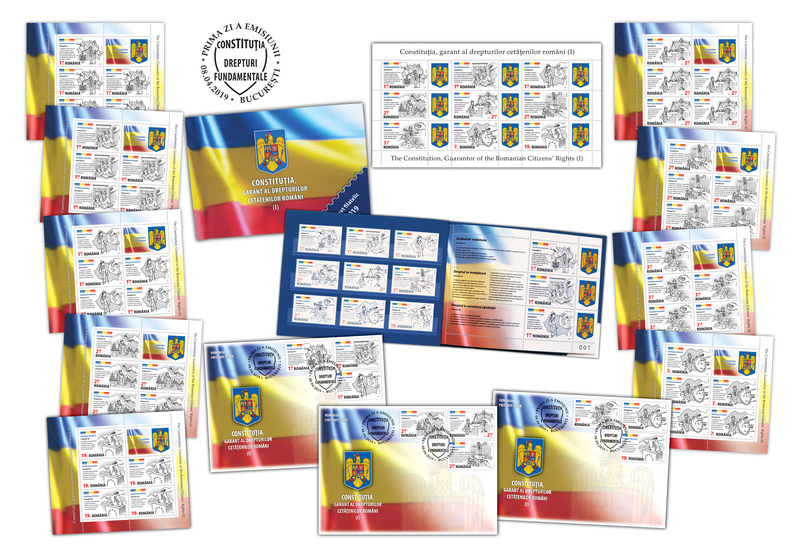 On the background of the stamp, the map and the coat of arms are found, so that Romania is the common space, identifiable by appeal to national symbols, in which fundamental rights are not negotiated. Article 32, on the “Right to Education” of the Constitution, is illustrated on the stamp with the face value of Lei 1.80. Education is essential for the personal development of the individual and the formation of the citizen in society. The State is responsible to ensuring the provision of educational services according to the right to education. State education is free, under the law. Thus, the right to education of children and young people – of all citizens – corresponds to the obligation of the State to organize compulsory general education, upper secondary education and vocational education, higher education, as well as other forms of training and further training. The right to healthcare is a fundamental right of the citizen closely linked to the right to health and welfare. 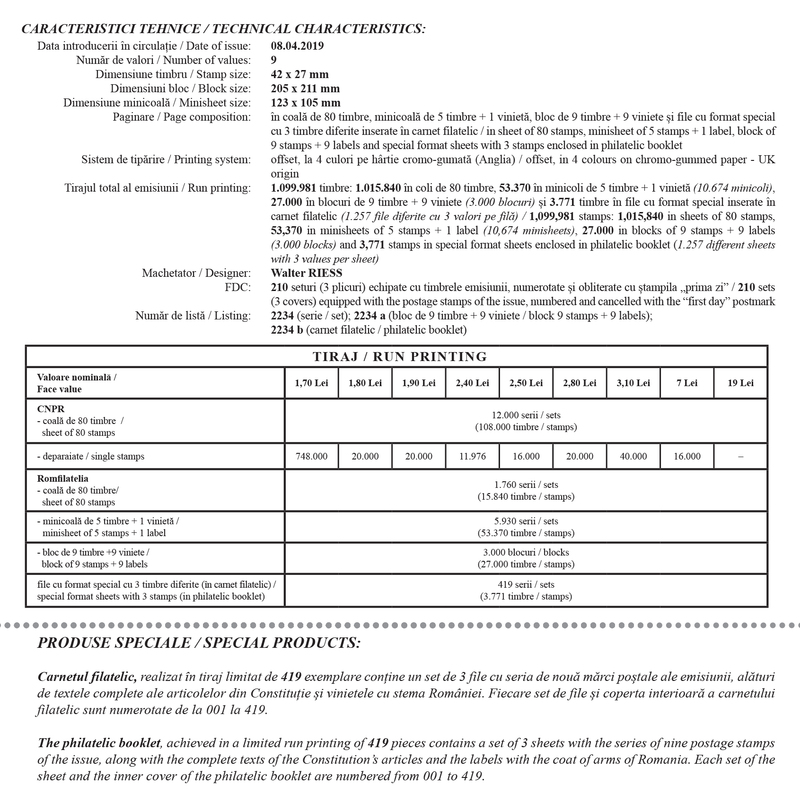 Thus, the stamp with the face value of Lei 1.90 is illustrative for the Article 34 of the Constitution guaranteeing Romanian citizens the right to healthcare, the State being obliged to take the necessary steps to ensure hygiene and public health. Health is a condition that is fully favourable to physical, psychological, individual and social existence and integrity. The free access to justice is represented graphically on the stamp with the face value of Lei 2.50. Article 21 states that justice is a public service to which any person may address freely to defend his/her rights, freedoms and legitimate interests. No law may restrict the exercise of this right. Article 35, graphically illustrated on the stamp with the face value of Lei 2.40, affirms the fundamental right of the human to a healthy and ecologically balanced environment. This, in principle, implies the right to live in an unpolluted environment, undamaged by activities that can affect the environment, health and well-being of people. The freedom of expression is a pillar of democracy and a prerequisite for intellectual and social progress. The representation of the Article 30 of the Constitution, belongs to the stamp with the face value of Lei 2.80. The free movement, guaranteed by Article 25, is represented graphically on the stamp with the face value of Lei 3.10. The free movement has a broader understanding in relation to the idea of citizen, independently of individual differences, undertaken activity, or residence area. Article 24 – The right to defence is illustrated on the stamp with the face value of Lei 7. This right concerns all those guarantees provided by law and made available to any person in order to be able to defend in a trial. The right to be elected to the European Parliament, as stipulated in Article 38, can be found illustrated on the stamp with the face value of Lei 19. This right is representative for the member states of the European Union. Romania joined the European Union in 2007. After 100 years, Romania, as a democratic State of the European family, is determined to effectively guarantee the fundamental rights and freedoms promoted for knowledge and understanding by this thematic issue. Romfilatelia brings many thanks to Mr. Senator Robert-Marius Cazanciuc, the President of the Legal Commission, appointments, discipline, immunities and validations in the Romanian Parliament, the initiator of the project, for the documentary support given to the development of this postage stamp issue.